Could your sales use a boost right now? Looking for a new idea or two? Listen to my appearance on the CONNECT! radio show with Deb Calvert. In this hour-long interview, I share ten strategies and tactics you can use to increase your sales. Whether you’re a salesperson, sales manager or business owner, you’ll get something of value from this program. To learn more about Deb Calvert and listen to her interviews with other business experts, check out People First Productivity Solutions. Whether you’re in sales, marketing or HR, you need to understand Klout. And if you’re a small business owner, professional or CEO, you need to fully embrace it. 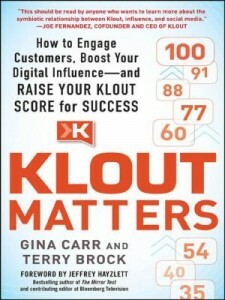 Gina Carr and Terry Brock do an excellent job of answering that question in their new book, Klout Matters: How to Engage Customers, Boost Your Digital Influence and Raise Your Klout Score for Success. What exactly is Klout? In simple terms, a Klout score is a measurement of a person’s—or a company’s—online influence. Carr and Brock liken it to a FICO credit score or a BMI (Body Mass Index) score—it doesn’t tell you everything, but it gives you a pretty good idea of where you stand in a simple, easy-to-grasp number. Your Klout score is based on how, how much and how often people engage with you in the social media world. Klout’s algorithms use more than 12 billion pieces of data every day to determine how influential a given person or brand is. 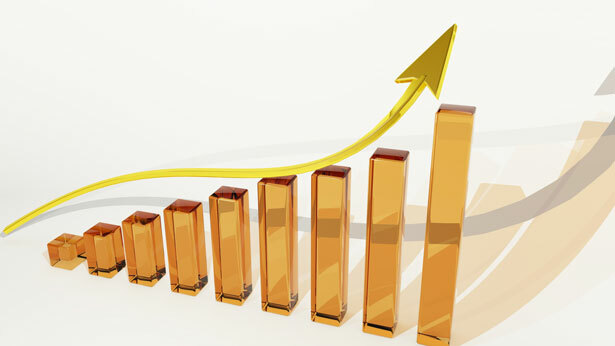 Is there value in raising your Klout score? Yes and no. For most companies, your prospective customers aren’t looking up your Klout score to decide whether or not to buy from you. But if you’re a professional (a speaker or consultant for example), or you work in sales or marketing, a high Klout score could mean the difference between the job going to you or to someone else. “Another example of using a Klout Score would be for a local business to seek out key influencers. A restaurant might want to target particular customers who have a high Klout Score. These individuals could be offered certain discounts or VIP treatment. These customers would then be able to talk about the service they received and the quality of food at the restaurant. Carr and Brock offer many more strategies for using Klout in your business, as well as for improving your social media effectiveness, which leads to a higher Klout score. The book covers how to set up your Klout profile, the difference between being influential and being noisy, and tactics for maximizing your impact on Twitter, Facebook and LinkedIn. Klout Matters is well-researched and well-written. It’s a valuable book for virtually anyone in business. Klout is a whole new type of business tool. And it’s a tool that, if used strategically, can boost your sales and your overall business success. Jay Conrad Levinson passed away last week at the age of 80. 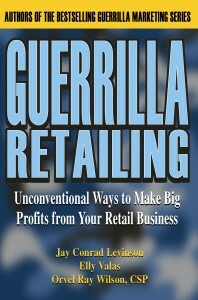 Jay wrote the seminal book, Guerrilla Marketing, which fundamentally changed the way people thought about marketing. In all, he authored or co-authored 58 books, which have been published in 62 languages, selling more than 21 million copies. Before he revolutionized small-business marketing, Jay spent more than two decades in the advertising industry, where he helped create some of the most iconic marketing memes in history, including the Pillsbury Doughboy, the Jolly Green Giant, the Marlboro Man, Mr. Clean, Morris the Cat, and Tony the Tiger. He was also a colleague and a friend. I learned a lot from Jay. Here are six valuable sales, business and life lessons. Jay was a consummate thinker. And whether as an ad executive, a speaker or a consultant, he challenged his clients with his original thinking. 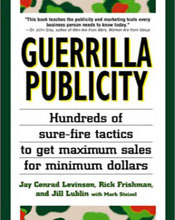 Guerrilla Marketing was born when Jay challenged his own thinking, realizing that the strategies that worked for big companies (with their big ad budgets) wouldn’t work for small companies. He rethought marketing from a new perspective and created an entirely new approach. What do you need to rethink? Jay didn’t rely solely on his own thinking though. Jay was smart enough to realize that two—or even three—heads are better than one. 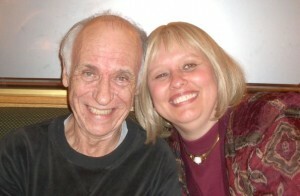 During his advertising career, Jay surrounded himself with smart, talented people. And throughout his writing career, Jay partnered with more than two dozen co-authors, including Seth Godin, Orvel Ray Wilson, Mark S.A. Smith, Elly Valas, Shane Gibson, Michael Larsen, Jill Lublin, Rick Frishman, and Mitch Meyerson. Who could you collaborate with to achieve better results? 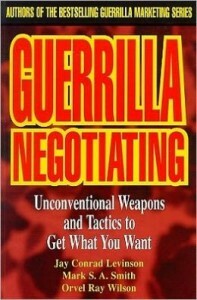 One of the reasons Jay had so many co-authors is that whenever someone would approach him with an idea for a new book in the Guerrilla Marketing series, Jay would say yes. Jay said yes to nearly everything, seeing potential and possibilities, rather than risks and downsides. How could you say yes more often? Throughout his nearly 60-year career, Jay loved what he did. From creating ad campaigns to writing, speaking and consulting, Jay took enormous pleasure in his work. Further, he always made time for fun with friends and family. I firmly believe his dedication to having fun made his work that much more effective. How could you have more fun in your work and life? Jay liked to see others succeed. He was a teacher at heart. 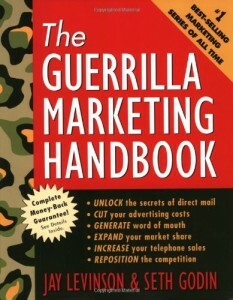 Guerrilla Marketing came about as a result of a class Jay taught at the extension division of UC Berkeley for ten years. And he was constantly praising and encouraging those around him. Who could use some encouragement from you? Jay was incredibly giving—of his books, of his time, of his support. And always with a smile on his face. 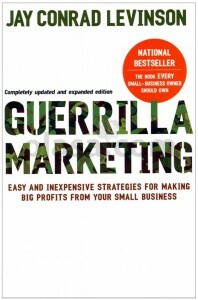 He never even trademarked the term “Guerrilla Marketing” because he wanted other people to be able to use it. That generosity created legions of fans and advocates. How could you be more generous in your business and your life? The legacy Jay leaves behind is tremendous, not just in books sold, but in businesses helped and lives touched. While his voice has been silenced, his ideas live on in his books and via the coaches he trained. Want to benefit from Jay’s wisdom? Visit the official Guerrilla Marketing website for free articles, tips and more. And whether you’re in sales or marketing, there are Guerrilla books that will help you be more successful. Hit Amazon for a complete listing. Better yet, stop by your local book store and pick up a few titles. Jay would’ve liked that. How did Jay impact your life or business? What lessons did you learn from him? Please share them in the comments below! Your product (or service) is great! Terrific! Fantastic! But it’s not perfect. Not by a long shot. It has flaws. Drawbacks. 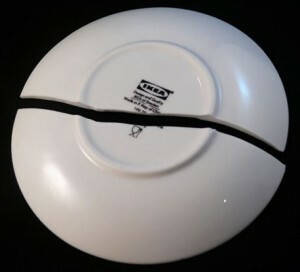 Downsides. And yet you have to sell it anyway. How? Listen to my appearance on Breakthrough Business Strategies Radio with Michele Price. In this eight-minute segment, I discuss the key to selling a product or service that isn’t quite perfect.